In our home, fall is the time of year when we do the most entertaining in our dining room, and I absolutely love to spruce up that space each year with some rich fall colors. This year, I used some great products from Tulip for Your Home to create a cozy fall tablescape brimming with vibrant fall hues and tons of great texture. With just a bit of paint, some fun stencils and a minimal amount of time, I was able to make some custom napkins, a table runner and a fun menu display to create tablescape that is not only perfect for displaying everyday, but also for using when the holidays come around. Let me fill you in on how it all came together! Today’s post is brought to you by Tulip. If you’ve always loved the stenciled home decor projects that are so popular right now, but you aren’t quite ready to tackle and entire wall in your home, creating fun displays like this tablescape is a great place to start. And the new line of products from Tulip Home make it so easy to do! With an assortment of stencils in both 14″ and 8″ sizes, as well as a full line of paint in gorgeous colors and handy tools to help get the job done, Tulip really has taken the guesswork out of how to take a plain-Jane fabric surface and turn it into a customized work of art. I was able to scoop up all of these supplies in just a matter of moments at my local Hobby Lobby. 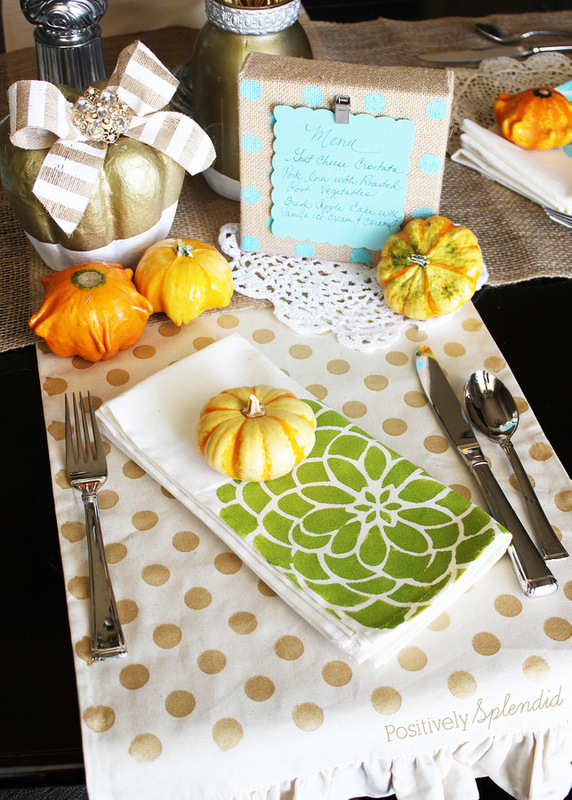 For my tablescape, I opted to paint some pre-made canvas napkins, as well as a fun ruffled table runner. I love getting the most out of my creative time by purchasing items that are ready made so that I can spend less time constructing and more time embellishing! 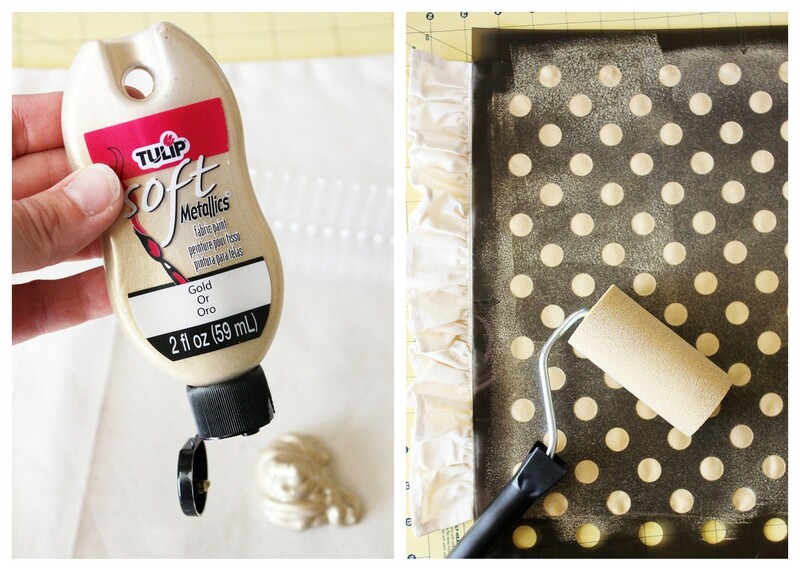 For the table runner, I went with a glamorous metallic look by using the 14×14″ Tulip Textile Polka Dot Stencil and Gold Tulip Soft Metallics fabric paint. I sprayed the back of the stencil with the Tulip Stencil Spray Adhesive and allowed the adhesive to dry for a minute or two before positioning the stencil onto the table runner. I squirted a generous amount of paint onto a plastic tray and then used the Tulip Paint Roller to paint in smooth, even strokes over the stencil, making sure the stencil design was fully covered. I removed the stencil while the paint was still wet and repositioned the stencil to continue the motif down the entire length of the piece. After I was done painting, I allowed the paint to dry completely. 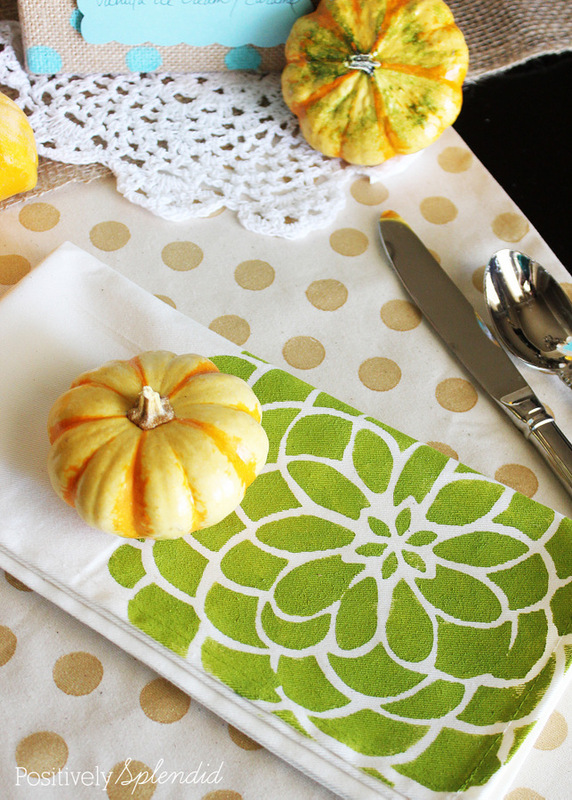 In no time at all I had a new table runner to use throughout the seasons! 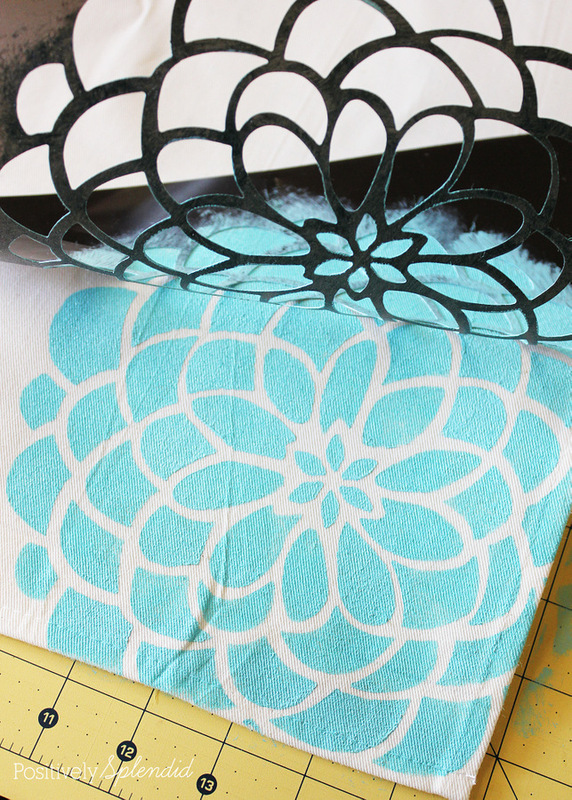 The process for painting the napkins was precisely the same as for the table runner, but this time I used an 8″ floral motif stencil and the Tulip Soft Matte Fabric Paint in Aqua and Avocado, positioning the stencil onto one of the corners of each of the napkins. I love that this paint dries to a soft, pliable finish that really makes it appear more like a silk screen than traditional fabric paint. And, the paint is full washable, which is a must when creating napkins, table runners and such that will come in contact with messy situations. In addition to traditional textiles, these paints and tools are also great for making other home decor items, like my easy menu display, which I made with a pre-made stretched burlap piece. 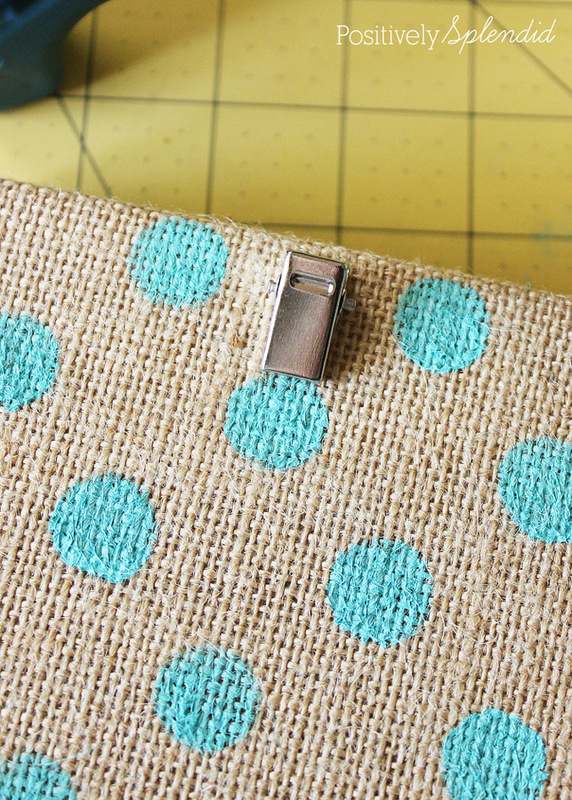 To make this, I affixed the polka dot stencil onto the stretched burlap piece, positioning it so the motif was centered. I squirted a generous amount of Aqua Tulip Soft Matte Fabric Paint onto a paper plate. Using the paint roller to paint over the stencil, I worked in nice, even strokes, making sure all of the openings of the stencil were filled. While the paint was still wet, I removed the stencil and allowed the paint to dry completely before I used hot glue to affix a metal name badge clip (found in office supply stores) to the top center of the piece. 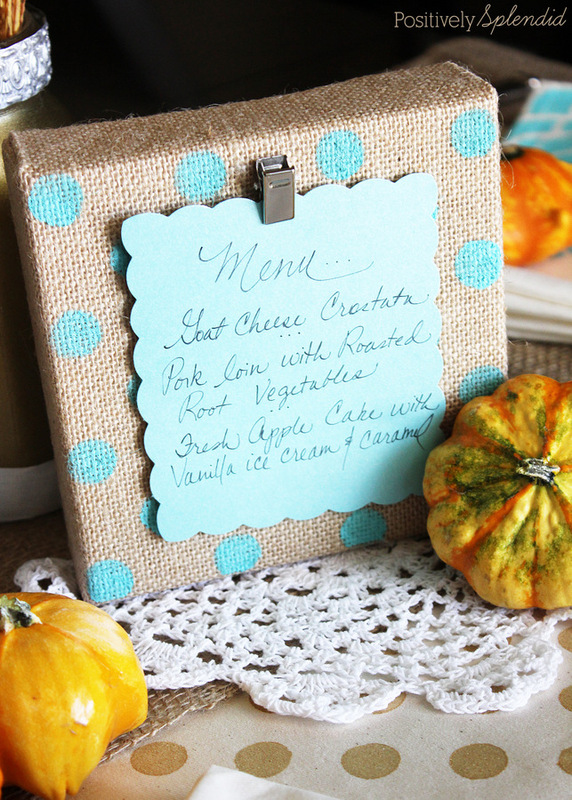 I love that just a bit of paint and creativity allowed me to take simple, ready made items and turn them into a pretty tablescape to enjoy throughout the fall season. Now that you’ve seen how easy it is to create custom stenciled home decor pieces, I hope you are inspired to spruce up your own spaces! For even more inspiration, be sure to check out the fun tips, ideas and projects shared by Tulip and I Love to Create on Facebook, Twitter and Pinterest. Disclosure: I received free product and compensation in exchange for writing this post. All opinions are entirely my own. I love how you used the stencils!! 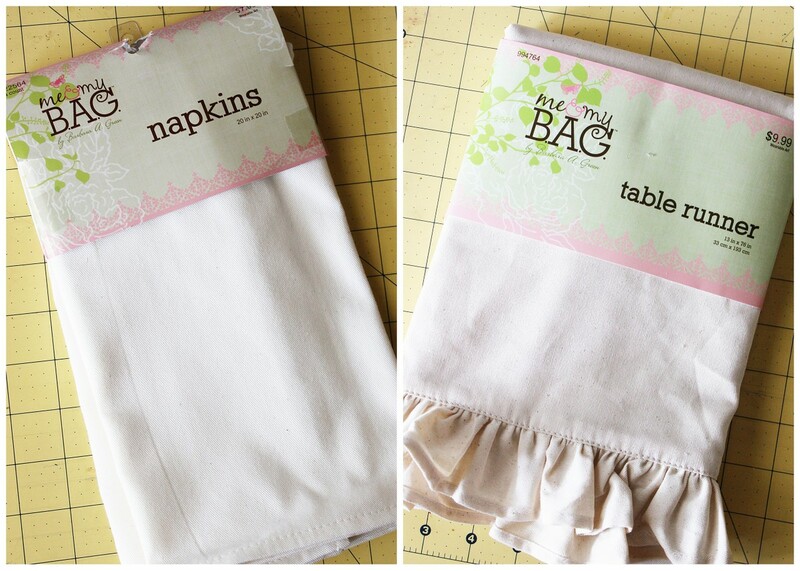 The napkins and table runner are beautiful! Love the menu board too!! Love it! !